Effectively handling file attachments is an important part of productive email habits. This post focuses on sending attachments. The attachments you receive are covered in the post on organizing email. The rule number one is to question whether an attachment is really necessary. Never attach images of your corporate logos or other useless information (it’s Rule 7 of the Email Charter). If you are collaborating with colleagues on writing or other projects with multiple documents or multiple versions of the same document consider using Dropbox or Google Docs instead of exchanging endless emails with attached multiple versions that need to be re-named, saved, edited and sent back. Note that Dropbox can also be used to quickly and smoothly share a link to a file or a folder even with people who do not have a Dropbox account. If you are sending a relatively short (less than a thousand words) piece of text (e.g. your contribution to a collaborative writing project), append it to the body of your email as plain text. It will be much easier for your colleagues to read, to copy and to paste in their document than if you send it as an attachment. If at all possible, avoid sending attachments in proprietary corporate formats such as Microsoft Word. First, your colleagues may not have this expensive software or the right version of it. Second, it will take their time, attention and a lot of computer resources to open your file (on slightly older computers MS Word may take 10-20 seconds to start!). A file with a single word takes 4 kB as plain text, 8 kB as a pdf document and 30 kB (about 4 pages of symbols – see more here) as a Microsoft Word document! Third, your text and graphics sent in an MS Word document may not display properly on another computer. Fourth, MS Word attachments may be infected by viruses (though fortunately, it’s not a concern for Macs). Finally, Microsoft Word (or its current version) may not be around forever and thus at one point your documents may become unreadable. About 20 years ago the most widespread word processor was WordPerfect. Who can now read files in the WordPerfect format? So if you can’t avoid sending an attachment consider attaching the file as a pdf document. The file will be smaller, faster and safer to open, as well as more sure to display and print correctly. PDF is an internationally agreed standard which is likely to be maintained by ISO for a long time. Sending files in other formats is only appropriate when you want your colleagues to edit them and when such solutions as Dropbox or Google Docs are not practical. So how do you send attachments without disrupting your workflow? If you have already located the file you want to send in Finder, the easiest is to use LaunchBar for sending it. Highlight the file (or multiple files), press and hold your LaunchBar activation key (for me it’s Ctrl-Spacebar) and when InstantSend is activated type the name of your recipient and press Enter. The LaunchBar will create an email message addressed to this person and with the selected files as an attachment. All you have to do is to type the Subject and press Shift-Cmd-D to send the message. No need to open your Mail or even to use your mouse. You can of course simply drag the file to the Mail icon in the Dock or to the already opened Mail message, but that requires using your mouse and is more time and attention consuming. If you use such file-organizing software as DevonThink, Leap or Papers to manage your reference files, e.g. scientific articles, it is probably easier to email such documents directly from within these programs using their in-build email functions. I use Sente as a reference manager and it does not allow direct sending of pdfs, but it can easily reveal them in Finder after which I use LaunchBar as described above. Another standard situation is when you want to email a file which you have just finished editing in a text processor, graphics editor or another program. The fastest way to do it is to use the program’s own email feature if such exists (as in Pages, Adobe Acrobat or MS Word). 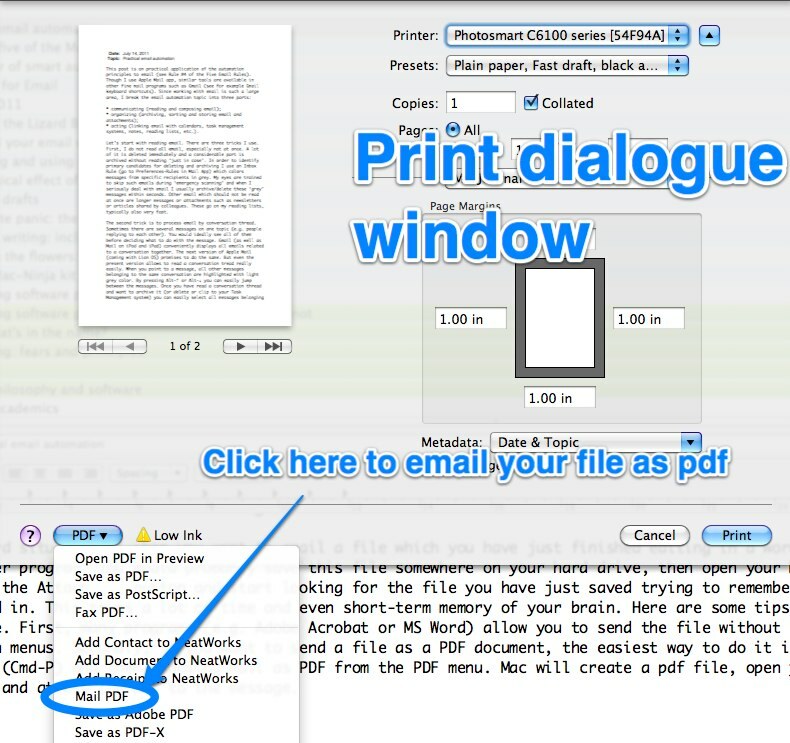 If you decide to send a file as a PDF document (which often is most appropriate), the easiest way to do it is by bringing up the Print dialogue (Cmd-P) and then choosing “Mail as PDF” from the PDF menu (see picture). Your Mac will create a pdf file, open Mail, start a new message, and attach the pdf file to the message. You will need to fill the recipient, the subject and press Shift-Cmd-D. Done! There are still situations when you have to attach a file from within Apple Mail itself (e.g. when replying to a message). In such cases my day is saved by DefaultFolderX, a great automation tool which I primarily use for tagging. DefaultFolderX saves the information on the folders you used recently and lets you retrieve them quickly. Thus, if you have just saved your file in a folder such as Documents/Projects/Teaching/MSc/2010-2011/EAP/ you won’t need to drill down through 5 levels of subfolders when looking for the file to attach. Instead all you need would be to to press Alt-↓ in the Attach File window (or use their menu) and have the folder in which the latest file was saved displayed by DefaultFolderX. This entry was posted in Automation, Email and tagged DefaultFolderX, DevonThink, Dropbox, Launchbar. Bookmark the permalink.